David Tennant completed filming Doctor Who on Wednesday 20th May 2009. David Tennant's final two episodes of Doctor Who were aired around Christmas / New Year. The End Of Time (Part One) was broadcast on BBC1 from 6pm until 7pm on Christmas Day in the UK and on 26th December in the US. The End Of Time (Part Two) was broadcast on BBC1 from 6.40pm until 7.55pm on New Year's Day in the UK and on 2nd January on BBC America in the US. This means that David Tennant's tenure as the Tenth Doctor was officially 6 years (2005 - 2010). David Tennant reprised his role as the Tenth Doctor for the Doctor Who 50th anniversary special episode which aired on Saturday 23rd November 2013 from 7.50pm until 9.05pm in the UK. It was broadcast at exactly the same time around the world. 93 countries broadcast the episode so it was seen by 100 million people! 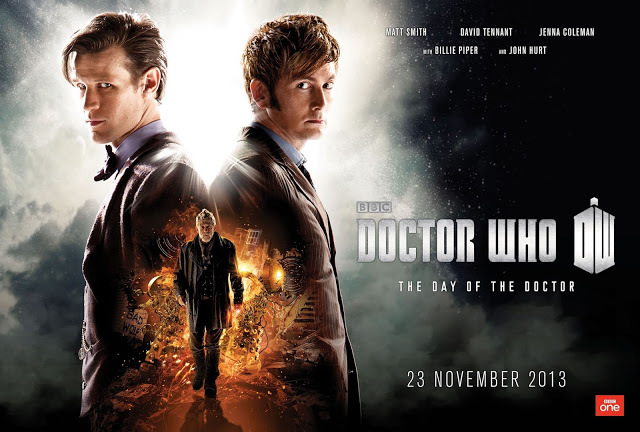 The episode was called The Day Of The Doctor and was 75 minutes in length. On Thursday 14th December 2017 David Tennant was one of the actors who attended a special Doctor Who Breakfast in aid of Comic Relief. Posts related to Doctor Who on Blogger (usually with more detail). The BAFTA nominations have been announced. Jessica Hynes has been nominated for Female Performance In A Comedy Programme Award for There She Goes. It was 9 years ago today David Tennant regenerated from being the Tenth Doctor in Doctor Who.